SDMIMD Entrepreneurship Cell (E-Cell) - Swayam organized its flagship event ‘Startup Charcha' on 7th February 2019. The program began with a Panel Discussion on the topic ‘Entrepreneurship: Issues, Challenges, and the Way Ahead’, moderated by Dr. M R Suresh, Professor – Marketing, SDMIMD and also the Coordinator of the event. The Distinguished Panellists were Mr. Sanjay Srinivasmurthy, Director-Silicon Road, Mr. Krishna Narayana, Managing Director of Shyama Jewels and Dr. M Sriram, Professor – Finance, SDMIMD. This was followed by an insightful talk by Mr Sanjaya Doreswamy, Founder - Kuteera Kitchen. The keynote address was delivered by Mr. Narendra Narayanan, Founder & Managing Director of Vinyas Innovative Technologies Pvt. Ltd, Mysuru. The charcha concluded with open forum having interaction between the students and the distinguished guests. 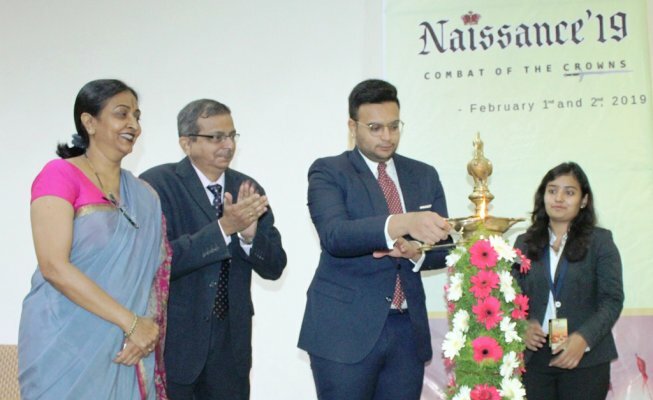 SDMIMD's flagship B-School Management Fest Naissance was inaugurated on 1st February 2019. The 2019 edition with the theme 'Combat of the Crowns’ was inaugurated by the Chief Guest His Highness, The Maharaja of Mysore, Yaduveer Krishnadatta Chamaraja Wadiyar. The two-day national level B-School fest witnessed intellectual battle and supremacy between the brightest minds of premier B-schools of India with the participation of 176 students from 18 colleges. The theme of ‘Naissance 2019 – Combat of the Crowns’ revolved around the management lessons and principles derived from the ancient Indian emperors and its implications in today’s dynamic business environment. Kristu Jayanthi College from Bengaluru emerged as the Overall winners of Naissance 2019.